Conference calls are goldmines for malaphors. This amusing ditty was heard on a conference call and Greg, a faithful malaphor follower, spotted it immediately. I’m not sure what “that” is, but it more than likely can’t be beaten with a dead horse. This is a mash up of “beat a dead horse” (waste time doing something that has already been attempted), “can’t beat (or top) that” (no one can do better than that) and the extension of the latter, “you can’t beat that with a stick” (no one can do better than that). A stick might be used to prod a horse so the speaker might have had a vision of using a stick to flog or beat a dead horse. 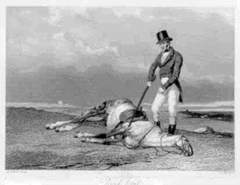 Actually, “you can’t beat a dead horse” is typically used to refer to putting effort into a lost cause. Whether previous attempts were made is beside the point: the horse is toast.